Conditions turned autumnal for day two of the Vice Admirals‘ Cup. 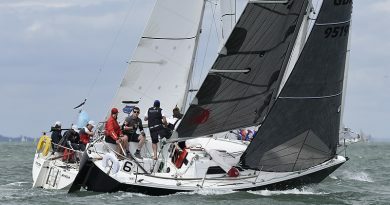 With seven fleets competing at the RORC’s annual regatta for invited one design and level rating classes, today crews found themselves wrestling their boats around the courses in 15-20 knot winds until a squall caused conditions to gust up to 28 knots, plus rain and reducing visibility. After her stand out Friday, Simon Perry’s Jiraffe found it harder going today but has managed to retain the lead in the J/109s. John Smart’s Juke Box was the lowest scorer winning today’s opening race, with David Richards‘ Jumping Jellyfish and Robert Stiles‘ Diamond Jem claiming honours in the subsequent two. The J/111s sailed two windward-leewards today ending the day with a round the cans course that was shortened at Gurnard Ledge. Even the invincible McFly had her upsets including one wild broach coming out of a gybe. While the results indicate otherwise, racing among the J/111s was still close. „You had to try until the very end. In the J/111s there are some very good owner-drivers,“ concluded Mack. 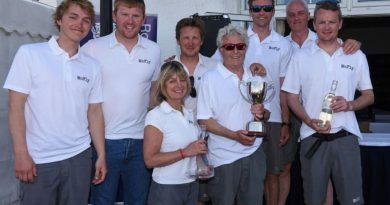 The eleven FAST 40+s spent the day thundering about the western Solent completing two 15-16 mile long round the cans courses, starting off Beaulieu with the last race finishing off Cowes. After a disappointing start to the Vice Admiral’s Cup, Invictus won both today’s races by a handsome margin. While Invictus won today’s first race by almost three and a half minutes on the water, in the second it was close with Johnny Vincent’s Pace initially fastest only to suffer a broach that allowed Invictus to pull ahead. With yesterday’s leader, Stewart Whitehead’s Rebellion, having a zero or hero regatta, so Invictus has taken the lead, now two points ahead of Tony Dickin’s Jubilee. If the FAST 40+s were hitting impressive speeds, the Diam 24od trimarans outstripped them. They sailed two long courses, of 15 miles and six miles, the former taking them deep into the eastern Solent. 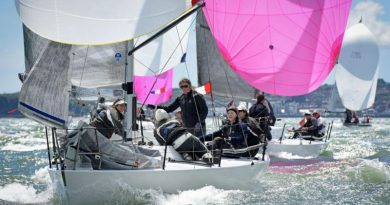 Piers Hugh Smith’s Maverick SSR almost scored two bullets but the British campaign, due to take part in the Voile de France a la Voile this July, accidentally failed to complete the course in race one. As usual the racing was closest in the Quarter Tonners where favourite, Sam Laidlaw’s Aguila was top scorer of the day, winning the last windward-leeward. Aguila is now four points ahead of Louise Morton’s Bullit. Today’s other winners were the Southworth’s Whiskers and Tom Daniels‘ Tiger. Today was a case of minimising handling errors even on the immaculately sailed Aguila. After seeing 24 knots they blew up their vang during a gybe. „We just hobbled over the line but fortunately we were far enough ahead to hold our position,“ recounted Laidlaw. Racing continues tomorrow at 1030 BST with the final three races to be sailed in the FAST 40+ and Diam 24od and two in the remaining classes. ← FOILING BAY: Winners keep the lead!